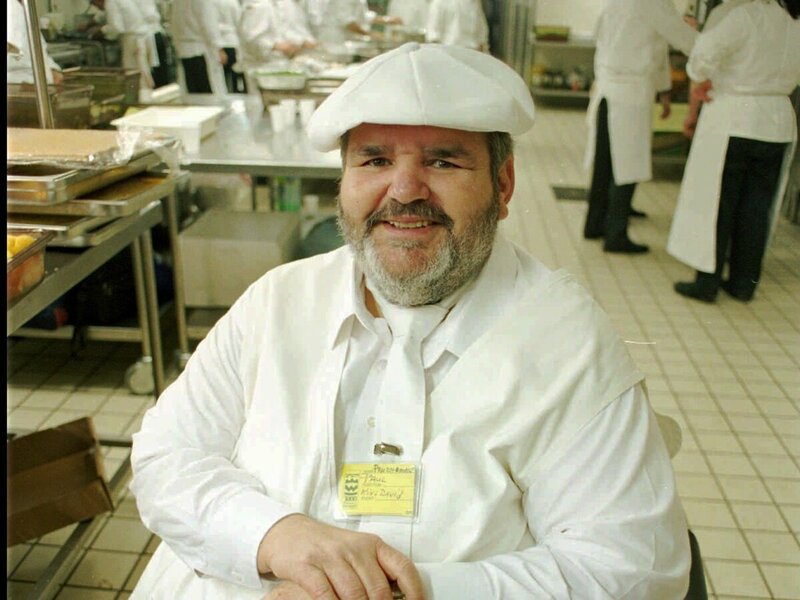 Louisiana Chef Paul Prudhomme, Who Popularized Cajun And Creole Food, Dies : The Two-Way The internationally renowned chef sparked a cooking craze and inspired other New Orleans restaurateurs. He was 75. Chef Paul Prudhomme posed in the kitchen of a convention center in Jerusalem in 1996. He and 12 other chefs prepared a 12-course kosher feast as part of Jerusalem 3,000 celebrations. Paul Prudhomme, the internationally renowned Louisiana chef who popularized Cajun and Creole cuisine around the world, died Thursday morning. He was 75. It's hard to overstate Prudhomme's influence on Cajun and Creole food. JoAnn Clevenger, owner of Upperline restaurant in New Orleans, says Prudhomme modernized it but kept the distinctive flavors. "He made a mark on classic New Orleans Creole and changed it forever," Clevenger says. "Classic New Orleans Creole has its roots in many different cultures, but it became stylized — when Paul first started, what he did was shake it up. He inspired people to be proud of their food and their culture." She adds: "His blackened red fish was influential all over the country." Prudhomme hosted several cooking shows, wrote numerous cookbooks and created his own line of spices and seasonings — Chef Paul Prudhomme's Magic Seasoning Blends. He opened K-Paul's Louisiana Kitchen, so named for him and his wife, Kay, in 1979. Located in the heart of New Orleans' French Quarter, the restaurant attracts diners from around the world. Clevenger says K-Paul's role today is two-fold: part honorific, part inspiration. "It's sort of a shrine to what Paul established, the glorification of Cajun food. Foodies from all over the country, all over the world come to eat there," she said. "But it's also an inspiration to local restaurants and chefs who have been inspired by what he's done." Another New Orleans restaurateur, Mary Sonnier, worked for Prudhomme at K-Paul's from 1983-88. She says his vision for cooking "changed the whole shebang." "He cooked fresh food and he started using his own seasoning blend. He sort of started the whole farm-to-table movement," Sonnier said. "When we opened every night, we opened with a new menu. We didn't buy food for the menu, the menu was created based on what food we had." "As the youngest of 13 children, Chef Paul was always adventurous. His strong curiosity of life and cultural customs motivated him to leave Louisiana in his early 20's and travel across the United States to experience every culinary environment possible. From an Indian reservation all the way to the finest, five-star restaurant, Chef Paul learned to love, appreciate and blend the flavors of his younger years with those of many other cultures." While his approach to Cajun and Creole food is widely recognized, his influence on other chefs, especially in New Orleans, can't be overlooked. "He inspired people to think they could cook like this, too. He made me think I could do it," Clevenger says. Sonnier says working at K-Paul's played a part in her decision to open her own restaurant with her husband. "He was a teacher and a mentor to me and a lot of other chefs and cooks that worked for him," she says. "Anything we cooked whether it was big or small — salad dressing, rice, stock — whatever you made you had to bring it to him. You tasted it together and he critiqued it. ... He taught you how to really taste food."